I love chocolate mousse. It is one of my favorite desserts; it brings back some of my childhood memories: Sunday lunch to the house of my grandmother Adele. Brioche and chocolate mousse was one of the numerous winter treats that we really enjoyed as a family! Despite the fact that French people are not the biggest consumers of chocolate in the world, eating chocolate is a serious business in France (6.6 kilos per year per person, the equivalent of a “tablet” per week). Actually, the French are primarily “chocolate tablet” lovers (32% of sales). And more importantly, we are world leaders in dark chocolate consumption (30% of the chocolate consumed is black against 5% worldwide); this accounts for half of tablet sales in France. Indeed, we learn to appreciate dark chocolate early in life. My brother, my sister in law and I, since our youngest age, as well as the next generation, my two nephews, we all love a piece of French baguette and a bar of dark chocolate as a snack. This was and still is the best snack after a day at school or an afternoon outside. Recently, dark chocolate has received worldwide a great interest, mostly because of its potential health benefits. In fact, we have rediscovered something that the Mayans, Aztecs and indigenous populations living in South and Central America know for millenaries. In both the Mayan and Aztec cultures, cocoa was the basis for a thick, cold, unsweetened drink called xocolatl… believed to be a health elixir. Chocolate mousse is a good way to enjoy dark chocolate. 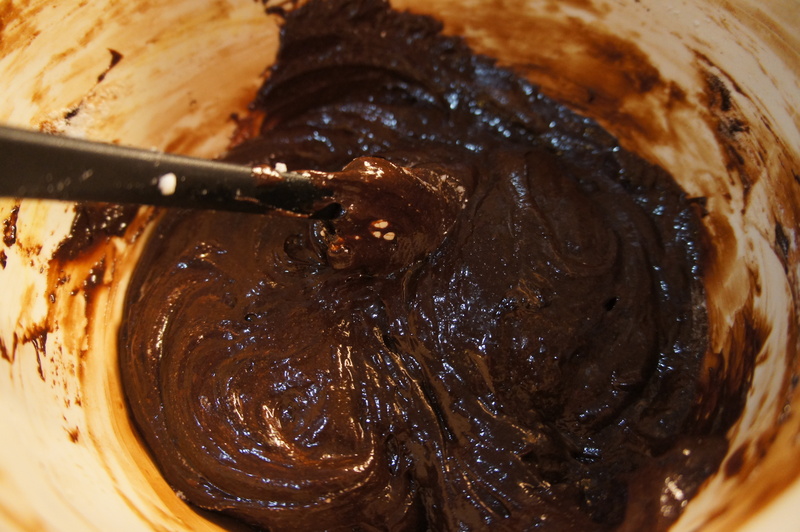 My recipe is quite simple and uses only 3 main ingredients: dark chocolate, eggs and sugar. This recipe uses raw eggs. I understand that this ingredient can be challenging for certain persons. I recommend using the freshest eggs you can get your hands on. Organic free-run eggs, directly from the farm if possible, are my first choice. These eggs have a richer yolk, a firmer white and just a greater depth of flavor. Eggs are easiest to separate when they are cold. When the egg whites are fresh, it takes more time and more force to whip those tight proteins into a foam. However, the foam that is created ends up more stable with small, strong, uniform bubbles. Cold temperatures also help keep the proteins rigid and stable. Be very careful when you separate the eggs. Any yolk (or other fat, oil or grease) that makes its way into the whites will keep the whites from whipping up as big and fluffy as possible. When I am separating more than two eggs, I like to use the three-bowl method: one bowl to crack the egg into, one to put the whites in, and one to put the yolks in. That way the accumulated whites aren’t contaminated by yolk if you accidentally break one. Importantly, the flavor of this mousse depends on the chocolate. I use top quality chocolate – good brand name, the one I really enjoy to devour like this. I really don’t recommend using baking chocolate; the result won’t be the same. Stir chocolate and coffee until melted. For this recipe, I broke up two “tablets” of Lindt Excellence – one tablet 70% cacao and one 90% cacao (average ~ 85% cacao). This are my French roots, I like dark chocolate and intense flavor. If this is too darker for you, you can use two tablets 71% cacao. I also like to use Green and Black’s organic 72% chocolate or Camino organic extra dark 80% and bittersweet 71% chocolate. It is really depending of my humor, my friends who will enjoy my cooking, and where I am buying my chocolate. Finally, to accentuate the deep and rich flavor of chocolate, I add some vanilla’s extract and strong coffee. 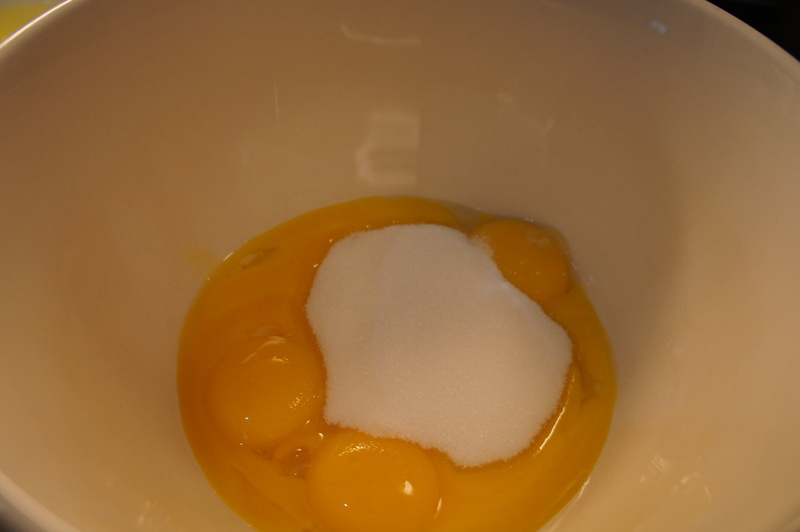 Fold some of the chocolate mixture into egg yolks and mix until smooth. I think it is time to cook. This is my recipe, for one truly classic French dessert… La mousse au chocolat that I prepare and enjoy since I am a young girl. You can combine two tablets of 100g 71% cacao, or one tablet 90% and one tablet 71%. You can go for a lower % of cacao; the important rule is to use a tablet of chocolate you like to consume like a treat. Keep in mind that if you choose a chocolate with a higher percentage (70% plus), your mousse may be slightly denser. This is a small quantity of sugar for the quantity of dark chocolate I normally use (200 g chocolate 85% cacao). Over the past 12 months, we have significantly decreased the quantity of sugar added (as well as salt) in our recipes. We have rediscovered the taste of foods and this chocolate mousse is one example – good quality chocolate doesn’t need to be underpowered by sugar. Use 60 grams of sugar and if you really think it is not enough, add an extra 20 grams in your chocolate mix before to add the whipped egg whites. 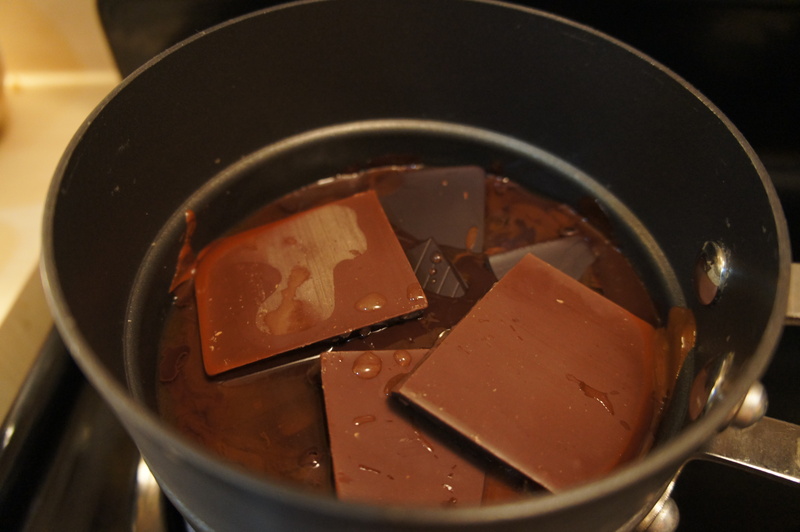 Place chocolate and coffee in a large bowl set over a bain marie (do not allow bowl to touch water because the chocolate will get too hot, causing it to seize or burn) or in a double boiler at a low simmer. Stir chocolate and coffee until melted. Remove from heat and allow to cool while preparing the other mousse components. 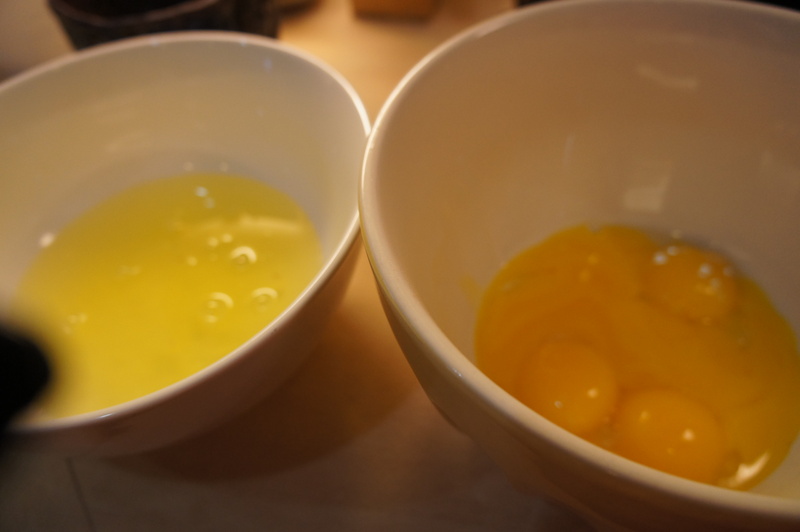 Whisk together yolks, 30 g of sugar, and a pinch of salt in a large bowl until mixture is silky and smooth. 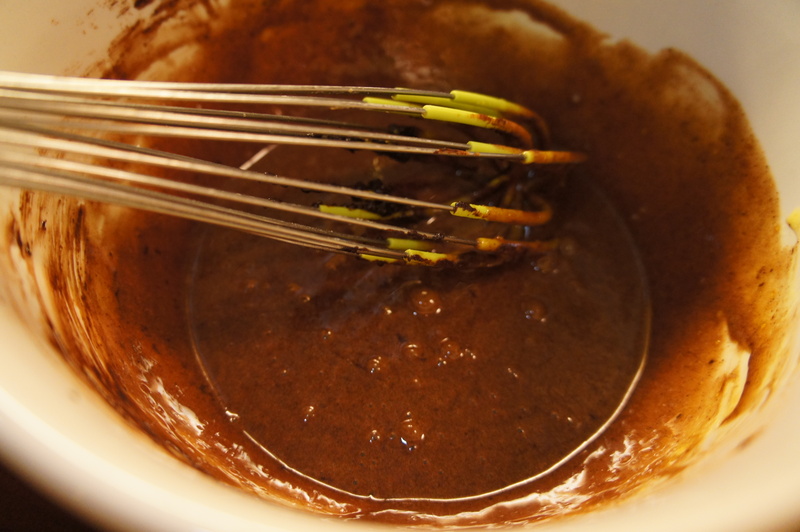 Fold the chocolate mixture into egg yolks and mix until smooth. With a hand mixer or mixer, whip egg whites to soft peaks. Add gradually 30 g of sugar and finally the vanilla extract and continue whipping until firm. It is not necessary to start with room temperature whites because with today’s electric mixers, they generate enough friction to quickly warm the whites to the right temperature for beating. Sugar interacts with the egg white proteins to help stabilize the whipped egg foam (egg whites beaten without sugar will not peak as firmly as those with), which is essentially a delicate protein network. It is very important to be aware of when to add the sugar while beating the egg whites. Always add sugar in a stream, slowly at the side of the bowl while the whites are being whipped; do not dump it in the center — if you don’t want to risk deflating the whites. 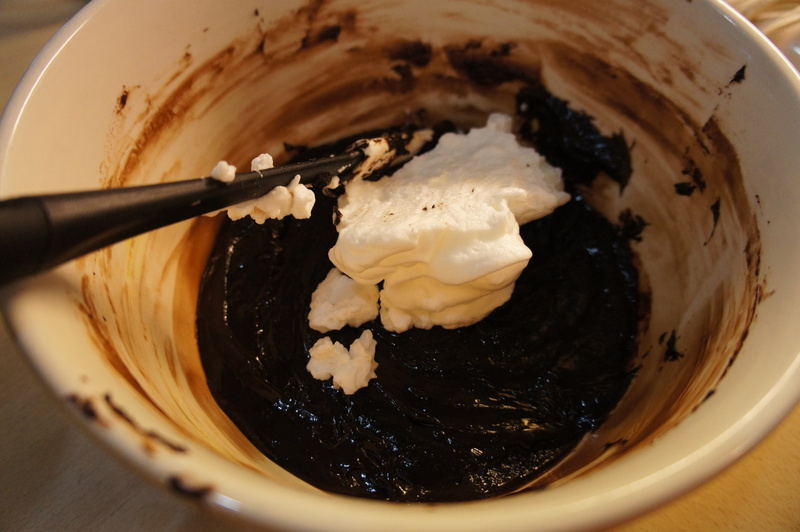 Fold one-third of the beaten egg whites into the chocolate mixture, and then fold in the rest of the whites just until incorporated. It is important to keep folding, from the outside in, in a figure-of-eight, until the mix is smooth and evenly colored. It will look a bit dodgy at first, but it will come together after a few minutes of dedicated work. Do not overdo it because the mousse will lose volume. 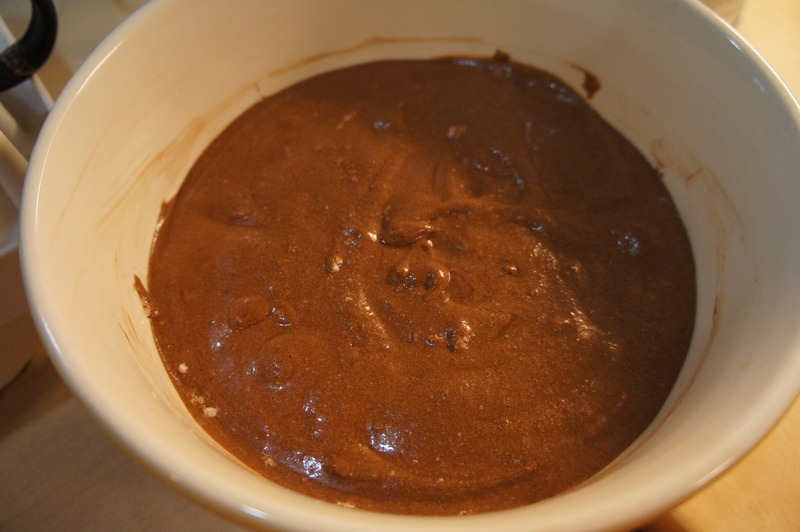 Transfer the mousse into a serving bowl or divide into serving bowls. Cover the mousse and refrigerate until firm, at least 4 hours. The mousse can be made one day ahead, and keep chilled. Let stand at room temperature for 10 minutes before serving. 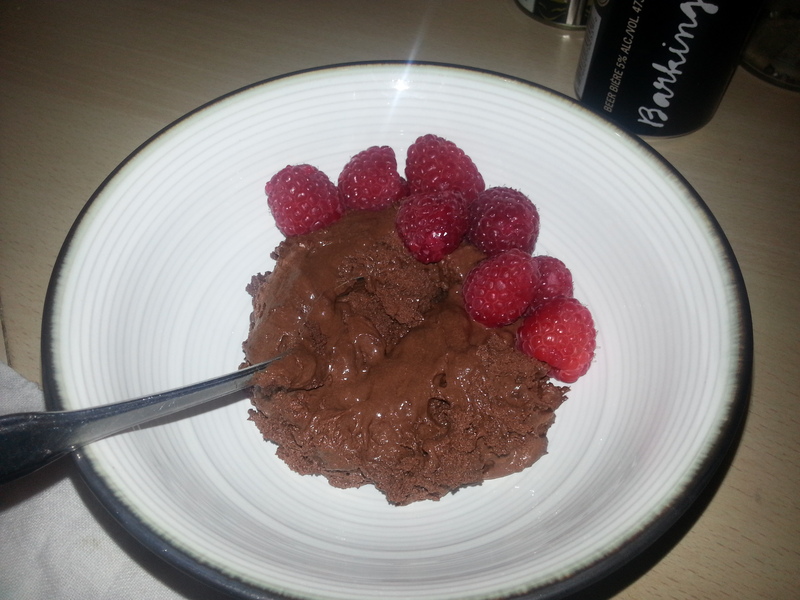 Serve the chocolate mousse with some raspberries and a piece of warm brioche, if desired. This is one among other perfect ways to end a meal. I really like your blog. Good job!